It took six years and four different variants to get the new Soviet postwar tank, the T-54, into full production starting in early 1952. Nearly 11,000 of them were produced by Soviet factories and then they went into production in satellite nation factories as well. But all the time the goal of the designers was to upgrade and improve the tank with a stabilized main gun. The Soviets were surprised when they received Lend-Lease Shermans as they came with a rudimentary gun stabilizer which was far in excess of Soviet achievements of the day. While it only worked in the vertical plane it improved probably of hit from a moving tank quite a bit. So after the war the Soviet designers went to work on introducing their own stabilized guns. 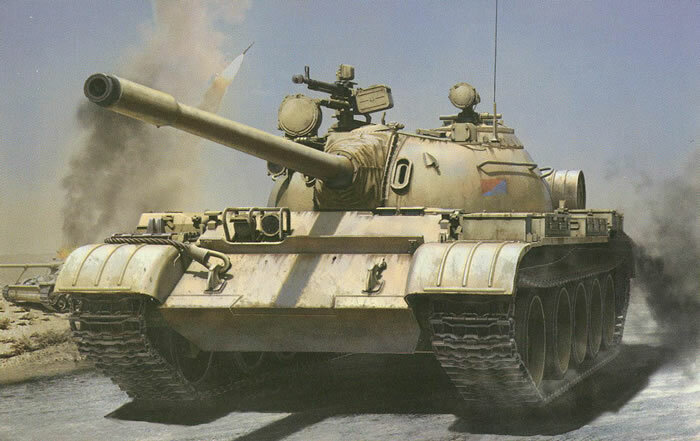 The first one to see production was the T-54A which entered production in 1955. Known as the Article 137G it had a single axis (vertical) stabilizer which was reliable and easy to use. More than 4.600 of these tanks were built. But they still wanted two-axis stabilization (vertical and horizontal) so work continued. In 1956 they came up with Article 137G2 with the “Tsiklon” STP-2 two-axis stabilizer. It was also upgraded to take both an IR searchlight and night sight plus another one for the commander to use with an IR sight as well. The final models were further fitted with the OPVT-54 fording system for underwater driving. But while highly successful, only 1,628 were built before Leonid Kartsev rolled all of the improvements together to create a new tank with even more improvements – the T-55 Model 1958. The tanks were popular with crews as all they had to do was hold the sight crosshairs on a target and when the gun sensed the bore was in line with the sight it would fire. It did give an improvement and the new effective range (by Soviet standards where 50% of the shots would hit the target) was now 1,550 meters. Tanks were “rippled” down to customers as Soviet units got the better T-55 tanks so it was widely sold to the Third World. A T-54B (bort number 843) is held as the tank that ended the Vietnam war when it crashed the gates of the Presidential Palace in Saigon in April 1975. Even with the fact that there were more than 25,000 T-54 tanks made by the Soviets and used all over the world, oddly enough nobody has ever attempted to make a kit of this seminal tank in 1/35 scale in styrene. This is the first effort from anyone and from the sprue breakdown in the kit the first of many others. Takom has quickly become a popular and skilled model company with some excellent kits that have filled in niches ignored by other companies. Their introduction of a line of T-54/55 based tanks will go far and should be quite popular. This kit is towards the top of the heap as it is a gorgeous kit that offers a number of options for modelers not seen in other kits. It provides two engine decks so the proper T-54 deck can be used with the kit as well as a choice of two kinds of wheels – the early “spider” finned cast wheels or the later “starfish” five-spoke cast wheels. While some T-54Bs had the “spider” wheels, sad to inform the naysayers that the original factory blueprints for Article 137G2 show it with “starfish” wheels. Realize that Soviet factories would use up what they had on hand before switching unless ordered to do otherwise so either one will be correct (I suggest you use photos for a specific vehicle). I got out the factory history and blueprints as noted and compared them. The only major difference between this kit and the plans is that the plans show it with twin MDK-5 smoke canisters at the rear vice the 200 liter fuel tanks. It comes with pre-clipped single link OMSh track links which are very nice on the face but have two ejection pin marks on each one. However they are the “proud” type and not recessed so a few strokes with a sanding stick solves the problem. Still it is a bit tedious but for my money is still better than having to fit individual guide teeth to each link! Takom comes with one of the best instruction booklets going in my opinion. It is concise and has good, clear exploded drawings of the parts as well as clear indications of what goes where. Step 2/3 covers the wheels; as noted you have a choice of which wheel centers to use. But they have the overexaggerated rubber molding lines on the tires which are a bit excessive. Modelers may wish to sand them down before use, especially on the running surface of the tire. A few modelers who have started work on the kits indicate that some of the tires do not fit properly so you will need to play around with them before cementing them up to see what works best. Unlike other T-54/55/62 kits up to this point Takom actually provides the fuel lines for the external fuel tanks! They form a continuous loop through all three tanks and back into the engine bay. This vehicle uses the earlier single bevel fuel tanks (L12) even though both they and the later double bevel style is included in the kit. The next few steps cover detailing. Note that if you want to a pre-1957 tank without the OPVT you should be able to leave off the sealing mounts (TP1/2/3/4). The light cluster consists of six parts but goes in quite neatly. The tank also comes with a cleaning rod case (Q2/Q3) for mounting on the left fender behind the narrow ZIP box which attaches over the track refitting cable (J19). This was not part of the original ZIP fit on the T-54B according to the blueprints. As with most Soviet/Russian tanks, the unditching log (Q6) needs some roughing up with a razor saw as it is too smooth to pass as wood. While the kit comes with a full set of T-55A hatches and cupolas the model must use the proper T-54/55 set on sprue X. It does have the proper full round hatch found on most of these tanks. There is no pretense of a gun inside the turret and only a small device to permit its elevation is provided with the two vinyl keepers as friction snubbers to hold the gun in position. From what the directions show once assembled the gun should remain flexible. With care the searchlight assembly will snap into place and also elevate and depress with the gun if so desired. Note that in Step 33 the finned DShKM is the proper weapon as the smooth barreled one is the Type 54. The main gun is a two-piece type but as I have often repeated a few minutes with a Flex-i-File will ensure it looks the part and means you do not have to purchase a turned aluminum barrel unless you want one. Overall this is a great kit with only a few glitches here and there to annoy the purist. The tires are probably the most annoying but a few minutes with a sanding stick will eliminate most of the overwrought rubber seams molded into the tires.